SC Pannell, is one of the most interesting winery visits I’ve done in Australia. Like most of the most interesting experience I had, besides great wine,it is always down to the wine maker, in this case, Stephen Pannell for S.C. Pannell. Stephen emphasized quite few time what is important to him is to grow the right grape varieties in the right places, and he doesn’t follow recipe of how to make a wine. He draws an analogy between his country’s art and wine. Australian artists hardly paint what they actually but very European looking pieces until recently. As for wine, he wasn’t sure if winemakers have really been making the wines they want to drink with everyone was looking to make how the french does. Instead, his holistic philosophy to winemaking starts with the climate, empahasises the importance on the vineyard, as well as wine’s relation to food they love to grow, cook, and eat. He said, “the unique thing about good wine is a representation of time and place” which I can feel it through his wine and the way he makes them. Owner and as well the wine maker of SC Pannell, he has been working in wine for most of his life. He grew up surrounded by wine: his parents established the Moss Wood vineyard in Margaret River in the late 1960s, part of a group of wine-mad doctors pioneering grape-growing in the region at the time. He worked for BRL Hardy for a decade from the mid-90s, an era of export boom and corporate expansion followed by massive oversupply and the beginnings of a bust. He won the Jimmy Watson Trophy for his first vintage at BRL Hardy’s Tintara Winery and quickly gained reputation for his restrained oak handling with shiraz and grenache. The takeover of BRL Hardy by Constellation in 2003 , he resigned in 2004 from the corporate winemaking life, and and has worked 14 European vintages in Burgundy, Bordeaux, Barolo and Priorat. He and his wife Fiona Lindquist established S.C. Pannell. “virtual” winery in 2004, like many of his contemporaries at the time, he bought in grapes and made his wines in other people’s cellars. In 2012, he purchase of a vineyard at Blewitt Springs planted in 1891. It had contributed half of the 1995 Eileen Hardy Shiraz that won him his first Jimmy Watson. And in 2014 he and Lindquist bought the old Tapestry vineyard in McLaren Vale and opened their long awaited cellar door in the heart of McLaren Vale. We met during the peak of harvest time and he took 3 hours out climbing up and down in his cellar grabbing bottles he like to share with me and chat about, which I appreciate much. After our meeting I drove with him to where he has to continue his fermentations work at another facility and it was already 7pm. I can tell Stephen is a very busy man, running like a busy bee. In fact, he isnot only for his own wine but he also works at Tinlins, a McLaren Vale bulk producer, making huge quantities of wine that’s sold to other companies. He is also a consultant to several companies across Australia to bring in the funds for his own brand. Amongst the wine we tasted, I especially like his Grenache 2015 and which stephen only makes it when the vintage shines. It is from a 70 year old vineyard with floral and musky nose; very balanced, silky texture with raspberry, turkish delight, long finish. 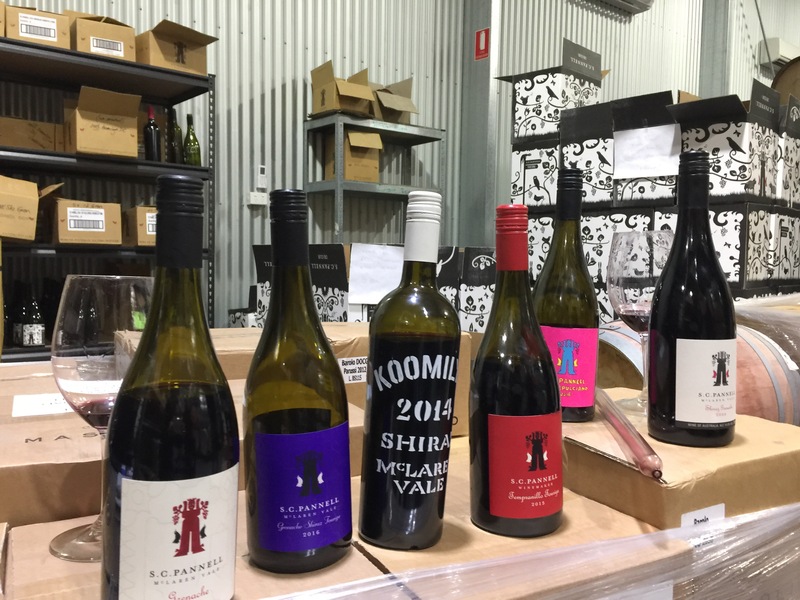 Also impressed and I bought a few bottles of his Koomilya Shiraz 2014. The wine is from the property – on Amery Road, blended from three of the Koomilya property’s Shiraz blocks, one planted in 1970 (to gewürztraminer, then grafted to shiraz in the early 1990s), the other two planted in the early 2000s. Vines grow on red iron stones with great depth of limestone under. This wine went into all large-format French oak. Only 852 cases were made. Rich and dense, Bloody, iodine, meaty yet elegant with generous red fruit, xmas cake and slightly liquorice, firm tannins with a salty long finish, definitely will show what it fully got by time.